This is a cute, clean romantic comedy. It’s actually one of those rare movies that shows married love in a positive light. Ned Stevens, the main character is handsome and successful. And sad. His wife has passed away from cancer. But his love and longing for her still fill his heart. Despite this, his college-attending daughter and his deceased wife of three years are both encouraging him to start dating. The wife appears to him frequently and he talks to her, but no one else can see her. To add to the mix, the daughter is dating a guy who is perfect in an obnoxious way, which annoys the heck out of the dad. He has a hard time seeing his daughter fall in love. I loved this movie because it was cute, charming and filmed in Midway, UT. Midway has always been a favorite place of mine to visit. We’ve had a few marriage or family getaways there at the Homestead or the Zermatt Resort across the street, like this one here. I also loved it because it made me laugh a few times, the stars are pretty, and the acting is good. But hey, can Kirby Heybourne stop appearing in roles as a 20-something? He’s forty years old and he doesn’t look like a recently returned R.M. anymore. I am happy to report that there’s no cheesiness in the movie! I can handle it in small doses, but when it’s through the whole movie, like in the R.M. and the Home Teachers, no thank you! Another thing that makes this movie rare is that it’s made by LDS people (Michael Flynn is the director, Dean Hughes is the writer, Kirby’s LDS, and maybe some of the other stars, I imagine) but it’s not made strictly for Latter-day Saints. It has no LDS references. Even Ned’s religious leader is called a pastor, not a bishop. It’s a great, uplifting movie about the tenderness of married love that carries on after death, father/daughter love, letting go of the past, and moving on. I give it 4 out of 5 stars. I guess if Ned’s hair had been combed more and the plot had more substance to it I would give it 5. So if you are looking for something light, cute, and funny for your date night, go watch it. Get it on Amazon Prime Video. Fun fact: the credits say that the writer of the movie, Dean Hughes, and his wife, Kathleen, appear as extras in the Snake Grill restaurant scene. I’m pretty sure they are the couple that open the door at the very beginning of the scene. 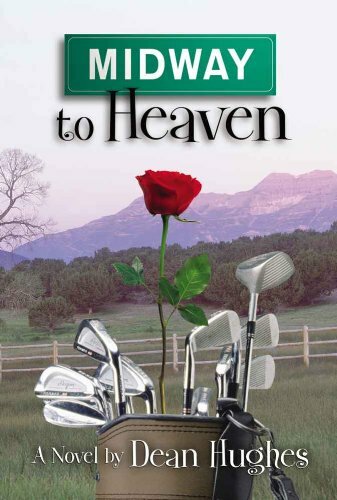 If you enjoy this movie, you will probably like the book it’s based on, Midway to Heaven, and other books Dean has written, like the Children of the Promise, and Hearts of the Children series.